Glasgow will have to improve to maintain their sensational start to the Pro 12 campaign, according to head coach Gregor Townsend. The Warriors went top of the table with five wins from five thanks to a 40-23 bonus point win away to Treviso. Townsend was happy with the character shown by his charges, but says they will have to step up away to Ulster. 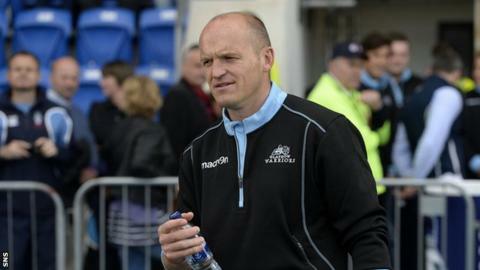 "It'll be much tougher next week and we'll have to play much better to beat Ulster," Townsend told BBC Scotland. Treviso took a 10-0 lead early in the match before Glasgow rallied. Tommy Seymour scored two tries, with Tyrone Holmes, James Eddie, DTH van der Merwe and Sean Lamont also crossing. Warriors, who finished runners-up in the Pro-12 last term, leapfrogged Ospreys at the summit thanks to the triumph in Italy. "It's great to get a win away from home and we have two more games before the November Test so we want to keep the momentum going," Townsend added. "There were times, particularly at the beginning of the game, when we weren't accurate enough in attack. We need to keep our discipline a lot better defensively but the way the players stuck to their task in the second half was terrific." "We've got to recognise that coming out to Italy in great weather, it's a different environment and we adapted well enough to score six tries and get the bonus point win. "We gave Treviso some possession to attack us in dangerous areas and they played very well. They came with a real attacking intent and deserved their lead. For our players to take their opportunities and score three tries in that first half was very good. "There were times, particularly at the beginning of the game, when we weren't accurate enough in attack. We need to keep our discipline a lot better defensively but the way the players stuck to their task in the second half was terrific. "When we were down to 13 men at the end it was great to see Treviso couldn't score a try during that period. "Our expectations are very high on what we have to deliver in training and games, and at times today it wasn't the standards we set ourselves. We know it will have to be much better next week, we're going to a very tough venue and are up against a very good team in Ulster. We're going to have to be at our very best to have another chance to win."